(Vatican Radio) The Preacher of the Papal Household, Fr. Raniero Cantalamessa, O.F.M. Cap., gave his fourth Lenten Sermon to Pope Francis on Friday morning in the Redemptoris Mater Chapel. The theme of the Lenten meditations is: “No one can say, ‘Jesus is Lord’, except by the Holy Spirit” (1 Corinthians 12:3). This fourth iteration carried the title: 'The Holy Spirit introduces us to the Mystery of the Resurrection of Christ'. The fifth and last Sermon of Lent will take place on Friday, 7 April. (Vatican Radio) Pope Francis on Friday greeted participants in a conference promoted by the Pontifical Committee for Historical Sciences, entitled “Luther: 500 Years Later: A rereading of the Lutheran Reformation in its historic ecclesial context", which took place in Rome from 29 to 31 March 2017. The Pope expressed his gratitude to God for the event, calling it a “working of the Holy Spirit”. Gratitude to God and surprise, Pope Francis said, were his first responses upon hearing of the conference on the 500th anniversary of Martin Luther presenting his 95 theses. (Vatican Radio) Ratzinger Prize-winning theologian Anne-Marie Pelletier is authoring the meditations for this year’s Good Friday Via crucis at the Colosseum here in Rome. Pelletier is a laywoman, born in 1946, who is married and has three children. She has spent her entire life in academia, compiling an impressive array of accolades, including the 2014 Ratzinger Prize in Theology – the first woman to receive the award. ROME-Pope Francis is interested in the “popular piety” found in Medjugorje, a small village in Bosnia-Herzegovina where the Virgin Mary has allegedly been appearing since the early 1980s. “The Holy Father is very interested in the development of the popular piety that takes place in this site,” said Polish Archbishop Henryk Hoser, tapped by Francis to study the pastoral situation of the town, which welcomes an estimated 2.5 million pilgrims from around the world each year. The fact that the faithful who go there “derive a definite spiritual benefit cannot be overlooked or silenced,” he said on March 27, according to SIR, the news agency of the Italian Bishop’s Conference. His words came ahead of his first visit to Medjugorje as papal delegate. The prelate also said that the mission entrusted to him has a “supplementary character” to the study made by the Vatican’s Congregation for the Doctrine of the Faith, which was led by Italian Cardinal Camillo Ruini. (Vatican Radio) Pope Francis received the students, faculty, and staff of the Pontifical Spanish College of St. Joseph on Saturday, in a special audience to mark the 125th anniversary of the founding of the institution. In remarks prepared for the occasion and delivered on Saturday morning in the Clementine Hall of the Apostolic Palace in the Vatican, the Holy Father shared a reflection on the three key terms in Jesus’ response to the Levite, who questioned him about the greatest commandment: to love the Lord with all one’s heart, all one’s soul, and all one’s strength. (Vatican Radio) Pope Francis issued an Apostolic Letter motu proprio on Saturday, in which he transfers general responsibility for the creation, discipline and administration of Catholic shrines and sanctuaries throughout the world, to the Pontifical Council for the Promotion of the New Evangelization. The new arrangement leaves in place the special laws granting other authorities specific competence over certain shrines and sanctuaries – and the pilgrims and pilgrimages associated with them. The Council for New Evangelization will now be directly responsible the establishment of international Sanctuaries and the approval of their respective statutes, as well as for the study and implementation of measures to promote the evangelizing role of the sacred places in the life of the Church and of the faithful, to promote an organic pastoral care plan for shrines and to promote both national and international gatherings aimed at fostering renewal of pilgrimages to places of worship and works of popular piety more generally. (Vatican Radio) Pope Francis has encouraged teachers, students and graduates of Peru’s Catholic University to be united and “walk together” giving value to its legacy in contemporary society and transmitting it to the new generations. The Pope’s words came in a letter addressed to Cardinal Giuseppe Versaldi, Grand Chancellor of the Catholic University of Peru, on the occasion of the first centenary of the institution. (Vatican Radio) Pope Francis’s scheduled visit to the northern Italian town of Carpi on 2 April will include a meeting with communities struck by the 2012 earthquake and a visit to the badly damaged Cathedral of Mirandola. A communiqué released by the Holy See Press Office provides details of the Pope’s 1-day journey to Carpi, a town counting some 70,000 inhabitants in the Modena area of the Emilia Romagna region. Over 20 people were killed and dozens of farms, castles, churches and other buildings were destroyed or damaged in the 5.8 magnitude earthquake that struck the region in May 2012. The Holy Father is scheduled to celebrate Mass, pray the Angelus, give his blessing to three new diocesan buildings, talk to priests and religious, and visit sites of the earthquake such as the Duomo di Mirandola. Pope Francis, who will be travelling by helicopter, will depart from the Vatican at 8.15 am and arrive in Carpi at 9.45am at the “Dorando Pietri” rugby field. Pope Francis presides at Holy Mass for the faithful of the diocese of Carpi, on the occasion of his pastoral visit to the city. In conclusion, the recitation of the Angelus prayer. Pope Francis visits the Cathedral of Mirandola and meets the earthquake-struck communities in the square in front of the Duomo. (Vatican Radio) Pope Francis on Sunday told the faithful not to remain trapped in the rubble of life, but to rise from the rubble and rebuild their lives with the help of God. I want to thank you for being here at this Mass. I want to thank all those who worked for this double “marathon”: last Sunday [for the inauguration of the restored Cathedral] and this. Thank you very much! And I want to thank you, the sick. There are 4,500 sick here! Thank you, that with your help the suffering Church, helped to carry the cross of Christ. Thank you! Many thanks to you! At the end, the Holy Father went to the Seminary of Carpi, where, at 1 p.m., he had lunch with the bishops of the region and the elderly priests who also live in the House of Clergy and Seminarians. Pope Francis met with diocesan priests, men and women religious, and seminarians, at 3 p.m. today, April 2, 2017, in the chapel of the Seminary of Carpi. The Pope is making a one-day pastoral visit to the northern Italian city, which was struck by an earthquake in 2012. After the welcome address by Bishop of Carpi, Mons. Francesco Cavina, the Pope gave a speech off the cuff. Zenit will bring our readers the discourse, translated into English, as soon as possible. Following his afternoon meeting with the diocesan priests, men and women religious, and seminarians in the Seminary Chapel, during his pastoral day visit today, April 2, 2017, to the northern Italian city of Carpi, the Pope briefly stopped at the Cathedral and he transferred by car to Mirandola. At 4:30 p.m., Pope Francis visited the Cathedral of Mirandola. The Holy Father stopped in the square in front of the entrance to the Cathedral, still unusable after the earthquake there in May of 2012. 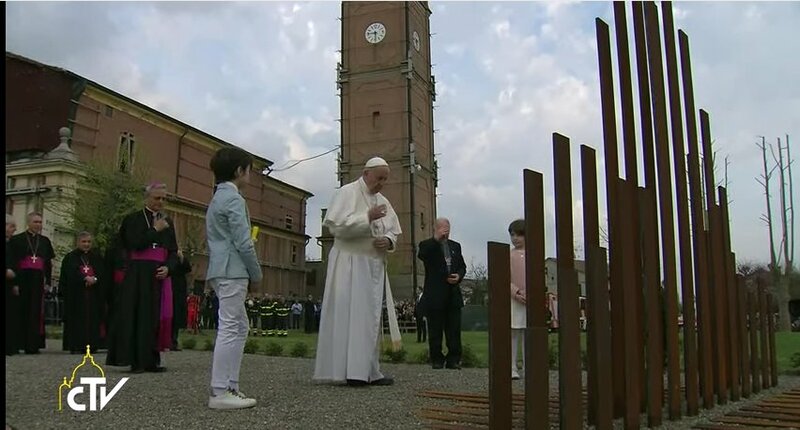 In the area adjacent to the Parish of San Giacomo Roncole of Mirandola, Francis offered a floral tribute to the monument in remembrance of the victims of the earthquake. At 5:30 p.m., the Pope and organizers said farewell and his helicopter took off from the sports field adjacent to the Parish of San Giacomo Roncole. At about 7 p.m., he will arrive at the Vatican heliport. In this city of yours, which still bears visible signs of such a ‘test’, I want to embrace you and the people of other areas struck by the earthquake on May 2012. My venerable Predecessor, Pope Benedict XVI, a few weeks after the event, went to this territory to bring solidarity and encouragement to its people and the entire ecclesial community. Today, I am among you to strengthen the affection of the whole Church, and to witness to each of you, my closeness and my encouragement for the journey of rebuilding, still underway. I address a cordial greeting to the Bishop of this Diocese, Monsignor Francesco Cavina, the parish and other priests, the mayor and other authorities. I renew my appreciation to the civilian defense, the volunteers and all who were involved, at different levels, in the restoration activities of the structures and the revival of community life. (Vatican Radio) Pope Francis said Mass in the chapel of the Casa Santa Marta on Monday. Reflecting on the Readings of the Day, the Holy Father focused on the significance of Jesus’ fulfilment of the law: what it means, and how He accomplishes it. (Vatican Radio) The Holy See Press Office on Monday released the details and schedule for Pope Francis' Apostolic Journey to Egypt, set to take place on 28-29 April. Pope Francis will arrive at Cairo International Airport around 14:00 on Friday where he will be welcomed at the Presidential Palace in Heliopolis before making a courtesy visit to the Grand Imam of Al-Azhar. He will then address participants in the International Conference on Peace before visiting His Holiness Pope Tawadros II. On Saturday, the Holy Father celebrates Mass and then has lunch with Egyptian bishops. His last event in Egypt is a prayer meeting with clergy, religious men and women, and seminarians. (Vatican Radio) Three new Syrian families have found shelter and welcome in the Vatican as part of an ongoing effort to provide the means and the tools for integration and a new life of hope for those fleeing conflict and persecution. All in all, thirteen people - from two Christian and one Muslim family - have been able make their homes in three Vatican-owned apartments recently vacated by other refugees who have since moved on to more permanent situations. According to a communiqué released by the Vatican Press Office, two of the families have fled violence and discrimination because of their Christian faith. They arrived in Italy in March. Beyond the hospitality provided, the Holy See also gives economic support to the 21 refugees who came to Italy with Pope Francis from the island of Lesbos, and who have found hospitality in private and religious houses. (Vatican Radio) Pope Francis told a Vienna “Trafficking in Persons” conference on Monday it is time to put an end to the “worsening tragedy” of child trafficking and slavery. The Pope’s words came in a message read out by Fr. Michael Czerny, SJ, Under-secretary of the Migrants and Refugees Section of the Dicastery for Promoting Integral Human Development, to the Organization for Security and Co-operation in Europe (OSCE)’s “17th Alliance against Trafficking in Persons Conference,” taking place in Vienna. In his message to the OSCE conference on trafficking in children, Pope Francis called the problem “a form of slavery, a crime against humanity, a grave violation of human rights, and an atrocious scourge”. “Today’s complex migration scenario is sadly characterized by ‘[…] new forms of slavery imposed by criminal organizations, which buy and sell men, women and children,” the message read. Click here to read the full text of Pope Francis' message to the OSCE Conference. (Vatican Radio) The Vatican's Dicastery for Promoting Integral Human Development has released a communique about an international conference to reflect on the 1967 encyclical Populorum Progressio. Entitled "Prospects for service to integral human development: fifty years since Populorum Progressio", the conference takes place on 3-4 April in the Vatican's Synod Hall. It aims "to study the theological anthropological and pastoral perspectives of the encyclical, especially in relation to the labour of those who work in favour of promoting the person, and to formulate guidelines for the activity of the new Dicastery." An audience with Pope Francis is scheduled to take place on Tuesday 4 April at 11:30.